Richard's jazz studies took place at the University of Toronto and the Banff Centre for the Arts. His teachers have included: Jim Blackley, Dan Bodanis, Joe La Barbera, Don Thompson, Phil Nimmons and Paul Read. He has also had coachings with Rob McConnell and Dave McMurdo. 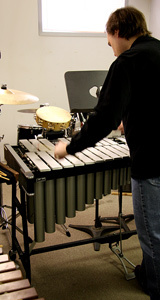 Richard has taught jazz drum set at Appleby College and privately. Performed with The Ron Paley Big Band, Charles Cozens, Hugh Fraser, Plakaso, Larry Bond Trio, Wilf Sharpe Big Band and the Swing Shift Big Band. Also played in many community big bands as well as the University of Toronto A & B bands.